First things first: No, the World Wildlife Fund (WWF) is not using drones to vaporize poachers. But thanks to a five million dollar grant awarded by Google on Tuesday, the organization is expanding its use of unmanned aerial vehicles to track and deter criminals who illegally hunt endangered animal species around the world. Prior to receiving the Google grant, the WWF had already deployed trackers in Nepal’s national parks. These drones are light enough to be launched by hand and can be programmed to fly about 18 miles at a maximum elevation of 650 feet, for almost an hour. The cameras on the drones allow rangers on the ground to spot would-be poachers, especially in hard-to-reach places. 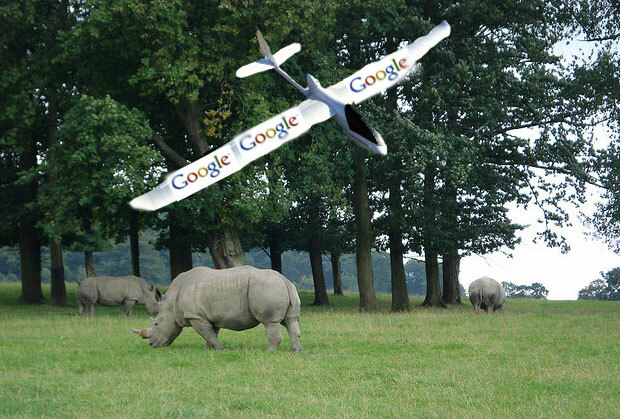 The Google funding will enable WWF to expand its drone program in Asia and Africa to protect rhinos, which are hunted for their horns; elephants, which are pursued for their tusks, and tigers, which are killed for everything from their eyes to their reproductive organs. The grant will also be used to advance wildlife tagging technology, specialized sensors, and ranger monitoring software. The grant is part of Google’s flagship Global Impact Award program, which this year, is providing a total of $23 million in funding to nonprofits addressing various challenges through technology and innovation. Some of the other organizations that received awards on Tuesday included the Geena Davis Institute on Gender and Media (which recently put out a study on why women have fewer speaking parts than men) and charity: water, which increases water access in developing countries through technology. Note: This image is not an actual Google-funded drone.